While the doctors at The Johns Hopkins Scleroderma Center search for a cure for scleroderma, they are successfully treating the disease manifestations and reducing the suffering caused by scleroderma. They also educate patients and their families about scleroderma and what is the best treatment approach. 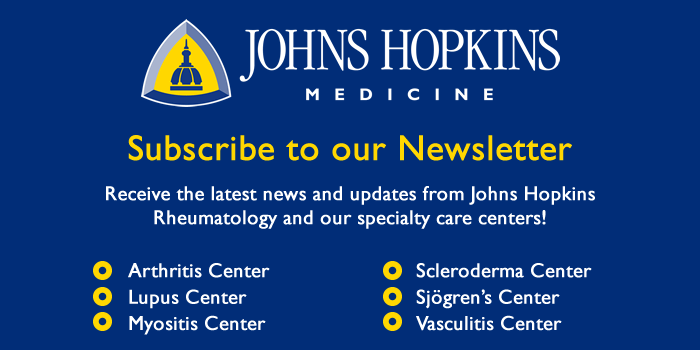 Since 1992, the Johns Hopkins Scleroderma Center has attracted thousands of patients from all over the world. Since the early days of the Johns Hopkins Scleroderma Center, Director Dr. Fredrick Wigley and his team have turned to their Hopkins’ colleagues for their expert help in the treatment of his patients. Johns Hopkins is home to renowned doctors who specialize in every aspect of the disease and all areas of the body affected by scleroderma. The success of The Johns Hopkins Scleroderma Center reflects the strength and cohesiveness of this extraordinary group. Thanks to patients of The Johns Hopkins Scleroderma Center, Dr. Wigley and his colleagues have built one of the largest resources to do research on scleroderma in the world. This includes a repository—containing data and blood and tissue samples from patients who chose to participate. These materials are available to researchers studying the biological causes of scleroderma, patterns of the disease, potential new treatments, and much more. Over a dozen scleroderma research studies (basic science, clinical trials, and epidemiology) are underway at Johns Hopkins. The Center’s researchers interact with other investigators within Johns Hopkins, other academic Institutions around the world, the National Institutes of Health (NIH), and industries involved in developing new medications and treatments. Dr. Wigley and his team are finding answers and are continuing to use the evidence to reach their ultimate goal of finding a cure for scleroderma.